Each year public schools across the state experience changes in their student enrollment levels – some see an increase, others a decline, while enrollment in some schools remain steady. A policy change included in the budget approved by state lawmakers for the current fiscal year 2015 means schools experiencing growth in student enrollment are no longer guaranteed to receive full state funding for the additional students when state lawmakers create a budget for the next school year. The new provision in the budget no longer includes enrollment adjustments for public schools as part of the baseline budget, also referred to as the continuation budget. Prior to this policy change the state’s budgeting process took enrollment adjustments into account when determining how much state funding is required to maintain education service levels. Doing so more accurately reflect the actual level of state funding that should be invested in K-12 education. Public schools that experience an increase in student enrollment from one year to the next must now wait until state lawmakers finalize a budget for the next fiscal year to know if enrollment growth is fully funded. Many public schools across the state could potentially feel the impact of this deceptively subtle policy change. For the most recent 2013-14 school year, 57 out of 115 local school systems experienced enrollment growth – about half of these school systems experienced an enrollment increase of 100 or more students. In the six years since the 2007-08 school year, 39 out of 115 local school systems experienced a net increase in student enrollment. The fiscal implications of this policy change could mean significant losses of state funding for public schools experiencing enrollment growth. 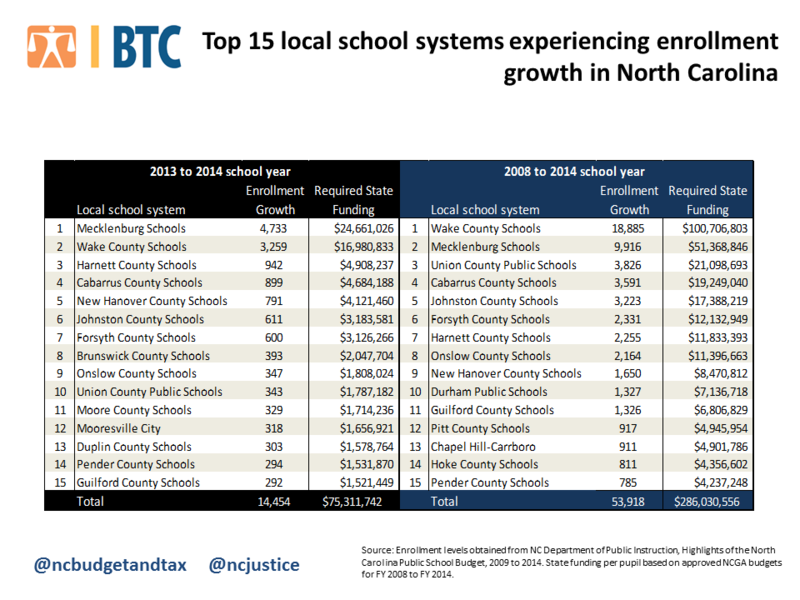 School systems such as Wake County Public Schools and Mecklenburg Public Schools, which have experienced significant enrollment growth since 2008, could have lost millions of dollars in state funding in recent years as a result of the policy change if state lawmakers decided not to fully fund enrollment growth. As a result of this policy change, local schools are now faced with determining staffing levels (classroom teachers and teacher assistants), transportation costs, and other school-level costs without knowing how much state funding for enrollment growth will be provided. If state funding fails to account for enrollment growth, local schools will have to look for dollars in other places to fill their respective budget gaps. Otherwise, schools will have to absorb the impact of this funding cut by making tough choices – increasing classroom size, cutting student support services, and cutting back on local teacher pay supplements, for example – that impact the quality of education. This policy change creates uncertainty for local school systems and serves as a hurdle, rather than a bridge, to local education leaders looking to ensure that all North Carolina students are afforded a quality education. This post is part of the NC Budget and Tax Center’s Blog series on the final budget passed by North Carolina lawmakers during the 2014 legislative session. See the rest of the series here.